I have the best pets ever. Nothing much new is going on. We had a nice Thanksgiving up on Whidbey Island and I can hardly believe that it’s almost December. We’re doing a gift-free Christmas this year, so I’m happy to be able to focus on baking and relaxing. No shopping! I have some really fun plans for the month. I’ll be taking a train trip to Portland with Emma and 3-year-old Oliver. Then I’ll be going to “Cinderella” at the 5th Ave Theater with Katie and little Julia, who will hopefully love it. And for New Year’s weekend, I just booked an oceanfront room at the Surfsand Resort in Cannon Beach. I’m super excited for that and it looks like some friends will be able to come, too. What a great end to the year. My feet are doing better on the Xeloda, but the fatigue is really getting to me. I’m tired of being tired. And I’m often feeling so tired but I can’t actually fall asleep, which is frustrating. The good part is that I’ve had lots of time to read and I’m just starting my 91st book of the year. I may just hit 100 books in 2011. I’m looking forward to Book Club at my house this Sunday, where we are discussing “The Marriage Plot” which is a new novel by one of my favorite contemporary authors. Next postMy Toenails are Disappearing! take his picture, I do think he knows how cute he is! How you were able to get the three darling buddies to line up for the photo is AMAZING!! We also do gift-free Christmas…started it several years ago…totally enjoy the holiday with decorations, food, music and events. That’s how they look every morning when I come out of the shower. 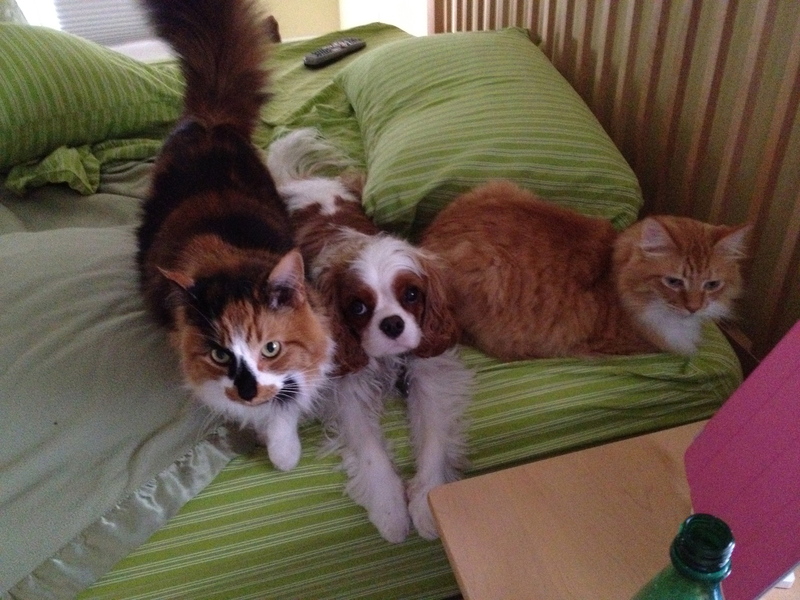 . . they are trying to be cute enough to lure me back under the covers for a nap with them!